2019 Coachmen Leprechaun 210RS (CHEVY) Class C Motorhome. Coachmen Leprechaun Model 210RS measures approximately 24 feet 9 inches in length and is powered by a Chevrolet engine and Chevrolet 4500 chassis. This beautiful RV includes the Leprechaun Value Leader Package which features tinted windows, dash radio with bluetooth, power awning, LED exterior & interior lighting, 1-piece countetops, metal running boards, solar panel connection port, glass shower door, Onan generator, recessed 3 burner cooktop with oven, night shades, roller bearing drawer glides, Travel Easy Roadside Assistance & Azdel composite sidewalls. 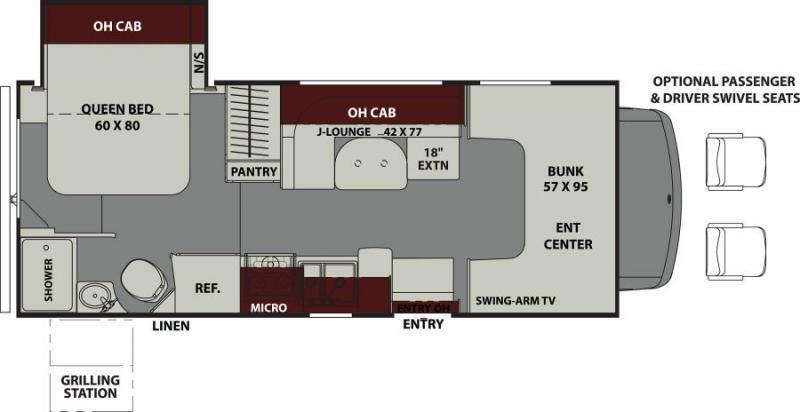 Additional options include upgraded foldable mattress, driver & passenger swivel seats, cab over and bedroom power vent fans, child safety net, cockpit folding table, exterior camp kitchen table, upgraded A/C, stabilizer jacks, slide-out awning, coach TV & DVD player, touchscreen radio & backup monitor, exterior entertainment center and a spare tire. Available in the TULSA AREA only at Route 66 RVs in Claremore, Oklahoma.